Beijing and Hong Kong are now on a collision course over Hong Kong’s future. Pro-democracy groups and ordinary citizens have been preparing for “Occupy Central,” a large-scale civil disobedience sit-in scheduled for later this year in Hong Kong’s financial district, unless there is an acceptable plan for a one-man, one-vote system for the election of Hong Kong’s next chief executive in 2017. 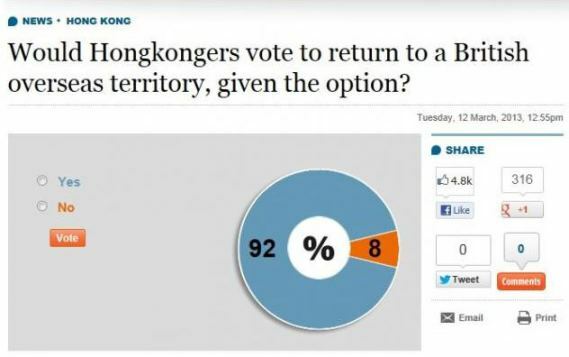 A separate March 2013 Poll: 92% of Hong Kongers polled want to be a British overseas territory. A recent poll showed that 62 percent of Hong Kong’s people want part of that plan to include the right to nominate candidates, rather than delegating that role to a small, unrepresentative nominating committee that could screen out “unpatriotic” candidates. Absent an acceptable roadmap within the next six to eight months, Hong Kong faces the prospect of civil disorder, mass arrests, and the international business community’s loss of confidence. There has even been mention in the local press of deploying the People’s Liberation Army to put down protestors, with Beijing’s local propaganda chief recently reminding the city that the central government had the power to impose a “state of emergency” if the Hong Kong government lost control. 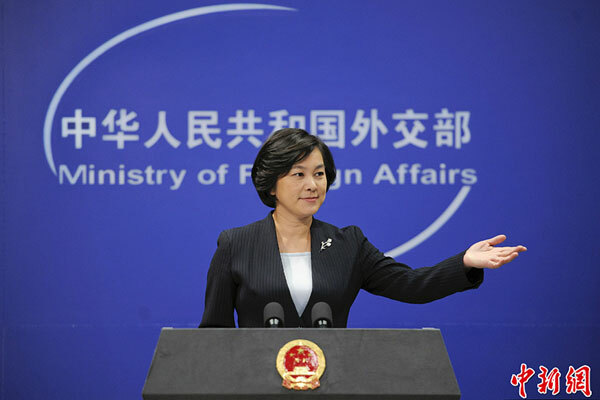 For the past 16 years, Beijing’s secretive Central Government Liaison Office in Hong Kong has been monitoring the Hong Kong government’s implementation of “one country, two systems” and has increasingly shown a willingness to intervene in purely local affairs that are under the jurisdiction of the Hong Kong government. Problem is, it has little expertise in foreign affairs or in dealing with foreign societies. And Hong Kong is still “foreign,” despite its overwhelmingly Han Chinese population. As a result, Beijing’s shadow government in the city regularly misreads what drives Hong Kong’s seven million residents, most of whom cherish freedom, rule of law, and an independent judiciary. So how did Hong Kong-mainland relations descend to one of their lowest depths since the handover? 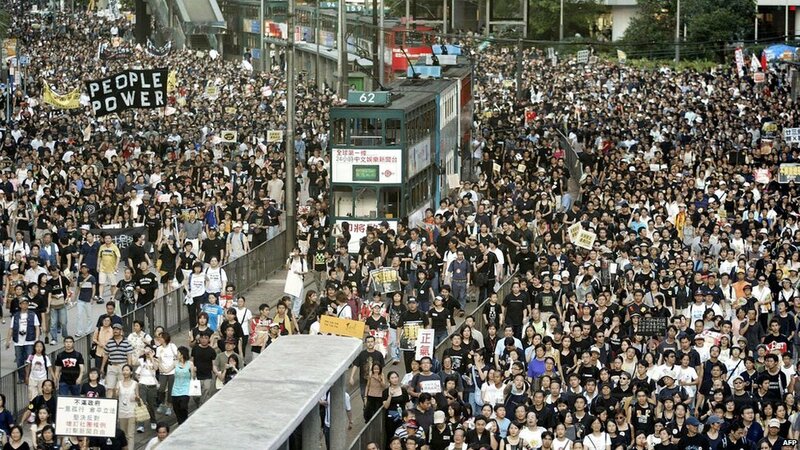 Observers point to several misjudgments by the Chinese leadership, but trace the roots of tensions to a pivotal event in 2003, when 500,000 Hong Kong residents took to the streets in protest against Article 23, a now infamous internal security law that Beijing expects Hong Kong to implement in order to fulfill requirements of the Basic Law, Hong Kong’s mini-constitution. Opponents continue to be concerned that its vague provisions against treason, secession, and certain political activities would curtail Hong Kong’s political and personal freedoms, if the article were ever to be adopted. China’s more interventionist approach in Hong Kong, however, has produced a number of embarrassing missteps that have only highlighted its general lack of understanding of much of the city’s thinking. Its recent failure to impose “national education” is a case in point. Anyone familiar with Hong Kong could have predicted the sit-ins and demonstrations that followed against what was widely perceived as a propagandized curriculum. 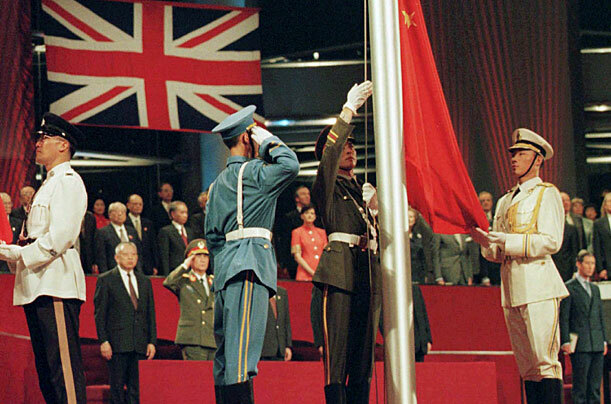 Critics castigated the government’s proposed teaching booklet, “The China Model,” for referring to China’s ruling party as “progressive, selfless, and united,” for criticizing multiparty systems as disastrous, and for whitewashing parts of Chinese history, such as the 1989 Tiananmen massacre. Such displays are not new. By 2008, Beijing had been raising eyebrows with its insensitivities to Hong Kong’s governing system of separation of powers, particularly the city’s cherished independent judiciary. That Chinese officials continue to misread Hong Kong, with its own “foreign” Cantonese dialect and alien culture, is now a daily reality for most Hong Kongers. Some have suggested that those more expert in handling China’s foreign relations should oversee Hong Kong. But China’s diplomats are not winning hearts and minds these days either — especially in their own backyard, where the country is facing growing isolation, and a regional arms race is building steam. To do otherwise risks deepening internecine feuding, a hardening of anti-mainland China sentiment, and years of political paralysis and poor governance. Born in Hong Kong, Martin Murphy is a former US diplomat and was head of the Economic-Political Section at the US Consulate in Hong Kong from 2009-12. He has contributed to the South China Morning Post, Global Post, and Wing Chun Illustrated. This article first appeared in Foreign Policy in Focus, a publication of Washington DC-based think tank, Institute for Policy Studies.